The hotel interior - what to remember when choosing a ceramic material? Designing hotel spaces is subject to legal requirements, which must be respected in accordance with the category of the object. Depending on the number of stars, we must take into account the mandatory framework imposed, connected with the size and necessary pieces of equipment among others. It is always a “starting point” for conceptual arrangement works. The room of freedom associated with the choice of style, the dominant colour and character of the interior, however, is still extremely rich. Technological advancement in the production of ceramic tiles allows not nearly unlimited implementation of arrangement visions. We have available not only hundreds of ready-made tile collections that can be freely combined, but also an option to individualise projects. Cutting out complex patterns in water-jet technology or printing on glass – these are just some of the techniques that allow you to give objects an absolutely unique character, thanks to special ceramic or glass elements made to order. The hotel’s foyer is usually adjacent to the hotel’s reception, so choose a ceramics which cohesively connects to the reception area. Of course, you do not have to use the same ceramics everywhere as in the entrance area. Take care, however, about the consistency of colours, formats, and style. Shades of grey at the reception allow you to use almost all colours as contrasting additions, giving it a unique character. Nothing stands in the way of combining stone patterns with collections imitating natural wood. In cosy corners of the foyer, with comfortable sofas and armchairs, wooden jars and hues bring a cosy, home atmosphere. The closer to the entrance zone, the more ceramics are exposed to abrasion by particles of sand, mud and earth, as well as moisture from rainwater or snow. In these places, use tiles with a high slip resistance (for example R12) and abrasion resistance (for glazed tiles – for example PEI 5/12000) or resistance to abrasive wear (for unglazed porcelain tiles). Be guided both by aesthetics and practical considerations. Compare the width of the corridors with the dimensions of tiles and select those formats which will best be composing in a given space. The layout and colour of tiles can suggest traffic directions and help users navigate the corridors. Also take into account the obvious practical reasons related to the clean-up. If only the investment budget allows it, choose rather rectified collections – a thinner joint means easier cleaning and a feeling of neatness for years. Check what tiles work best in investment facilities, including such as hotels. Ceramics are more and more often chosen cladding for the floors and walls of hotel rooms. Resistant, durable, very easy to keep clean, available in fashionable designs of stone, concrete, cement, concept and ceramic models that reproduce natural wood. Expertly laid on the floor and the selected wall, it will be a beautiful and economical solution. It does not require painting or expensive. It is resistant to mud, splashes with drinks, pressure, for instance wheels from suitcases. Skilfully illuminated, it emphasises the character of interiors – elegant ceramic structures can be their main decorative accent. When you choose a specific collection for a hotel room, be guided primarily by practical considerations. Remember that clean, very dark and very bright colours expose every grain of sand and any pollen – therefore, focus on neutral shades on which they will not be so visible. 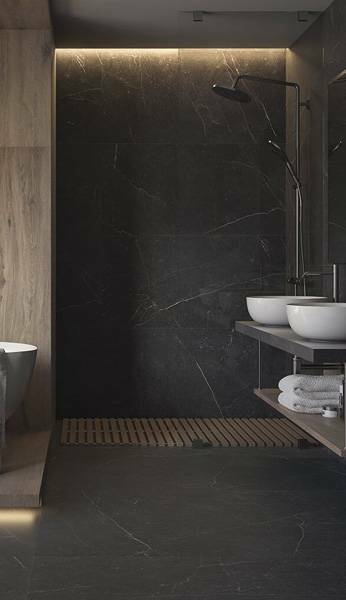 For the same reasons, select the rectified large-format tiles – the surface of the joints, which are the easiest “to grip dirt”, are minimized with their use and easier to clean. And the visual effect of large format ceramics underlines the high standard of the building. Large format rectified tiles are an elegant and practical solution. In hotel rooms, in our variable climate, a ceramic floor with underfloor heating works perfectly. Thanks to this solution, you gain more space to put all the useful furniture and equipment. No part of the wall is turned off by the radiator. Underfloor heating also saves a lot of space in the hotel bathroom. Almost all floor ceramic tile collections are suitable for underfloor heating using glazed and unglazed porcelain, monocottura and clinker technologies are suitable for floor heating systems. During detailed design work, remember to take into account the necessary dilatation and recommended width of joints for the selected tile format. A room with a bathroom separated only by glazing is one of the ways to visually enlarge the space of a hotel room and bathroom. however, for this modest space to look visually larger – we’ve already written here about how to do it. 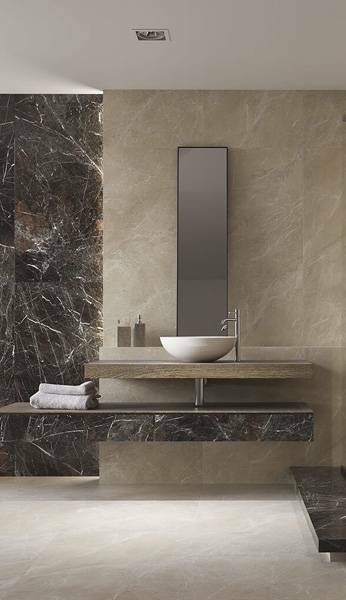 As the brightest shades of ceramic tiles, shiny enamel, light contrast elements in darker colours, skilfully used mirrors and tricks improving the proportions of the bathroom interior – these are some of the effective solutions. Comfort and unobtrusive expressiveness are the features a bathroom in a hotel should have. The so-called apartment units in five- and four-star hotels and motels, must have a much larger living space: a living room with a minimum area of 25 m2, a bedroom with a bathroom and an additional toilet in the auxiliary part of the entrance. The whole should of course be stylistically consistent (within a given apartment, if a special style is to be its distinguishing feature, or within the whole hotel facility). In the hotel’s apartments, you can freely “go crazy” with the arrangement. Here, for example, the combination of sleeping and bathroom space can have a truly spectacular shape. Combining a bedroom with a bathroom in beautiful apartments with a view is a way to maximize the advantages of an attractive location. The hotel kitchen must always be clean and comfortable for chefs, their helpers and waiters. There, breakfast is prepared (served or in the form of a Swedish buffet), lunch, dinner, supper, desserts, small snacks, cold and hot drinks. The meals served in the hotel restaurant are meant to delight the guests with their taste – and at the same time create almost in sterile conditions. Designing a hotel kitchen and restaurant does not differ much from arranging separate restaurant facilities – detailed information on this subject can be found in our earlier entry. Surely, the style dominating in a hotel restaurant must be consistent with the character of the entire facility. A hotel restaurant can have a unique look thanks to the use of water-jet technology, which allows you to make complex designs. Most hotels and resorts have training and conference rooms. Some objects are simply conference centres – the function of organising educational meetings is absolutely dominant in them. Sleeping rooms as well as restaurant and recreation facilities serve to provide optimal conditions for learning and relaxation between training sessions. In the educational rooms, the ceramic floor works just as well as in other places. However, it is important to carefully plan the acoustic conditions prevailing there. 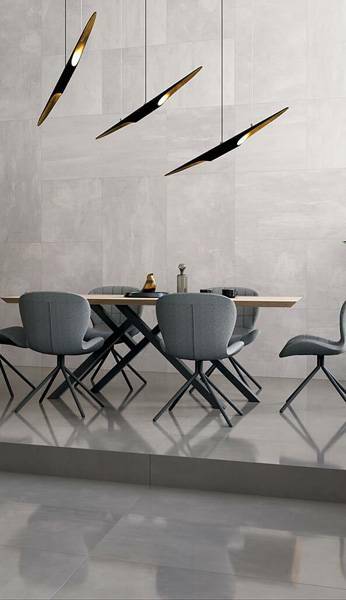 Ceramics is a hard material, not absorbing sounds, but reflecting them – that is why, with a ceramic floor, make sure that walls and ceilings are dampened with materials of high acoustic absorption. Also remember about soft and silent rubber wheels or felt pads under armchairs, tables, and conference chairs. Modern collections of large format ceramic tiles, such as Flash, will perfectly fit into the spaces of conference and training rooms. The semi-polished surface is elegant and at the same time easy to clean. Bedding magazines, grinders, laundries, boiler rooms, pantries and all the rest of the technical facilities are quite a lot, though not visible to the guests part of the hotel. There, utility considerations definitely dominate the aesthetic ones. There the parameters, hygiene and compliance with applicable regulations matter most. When designing a hotel swimming pool, they seem to be more likely to be collections-assured which meet the strict requirements related to safety and hygiene. Remember about the high anti-slip parameters of the tiles (for example R12) and that the wet surfaces are more slippery. So choose the tiles with the “bare foot” certificate. Also check the resistance to chlorine and strong washing and disinfecting agents. The “bare foot” certificate, Hygienic Certificate, special profiles and fittings make the tiles of the Gamma / Gammo collection with no worries you can arrange a hotel pool. The special structure of Gamma tiles radically increases traction for bare feet and prevents slippage. Two square formats, attractive subdued colours, excellent technical parameters, turned pedestals and convex and concave profiles of Bazo tiles make this collection successfully implement special requirements of pool spaces. You have to look comprehensively at the interior design of hotel interiors – the elements of this whole must coherently combine both in terms of functionality and aesthetics. In this way, you give the hotel expressiveness, thanks to which guests will be happy to come back to it, and the hotel staff will be satisfied with their workplace. Interiors of a hotel as an investment public utility facility must be designed in accordance with applicable legal requirements. Use only ceramic tiles in every hotel, whose parameters and performance correspond to the specific requirements of a given place. When choosing specific tiles, analyse the certificates and approvals they have been granted. Parts: reception, residential, restaurant, training, recreation and all technical facilities should constitute a coherent, aesthetic and functional whole. Remember that guests at first glance evaluate the object after the reception – make sure it is beautiful, safe and clean. Choose an anti-slip, abrasion-resistant ceramics that is easy to clean. 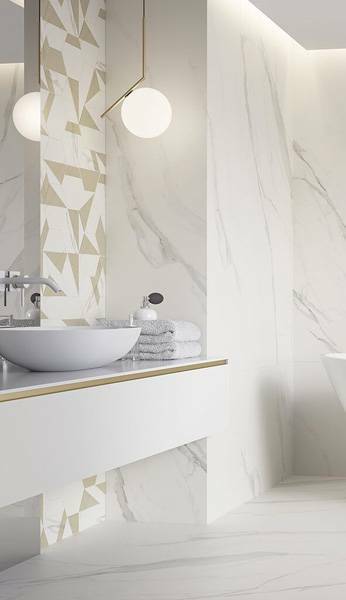 In rooms, bathrooms and hotel apartments, use ceramic tiles for underfloor heating boldly – a solution which guarantees good thermal conditions, aesthetics, and cleanliness. Use the potential of large formats and rectified edges of ceramic tiles. Keeping the well-chosen, clear style of the whole, introduce the dynamics into the hotel’s interiors, differentiating surfaces, formats, and shades.